This is a very unusual book, be warned. 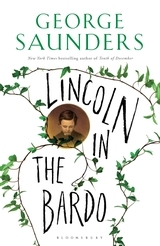 Lincoln in the Bardo is an odd and fascinating mixture of historical documentation and fantasy, which together paint a private and tragic portrait of one of American history’s best known figures. The story is mostly a father’s intense struggle with grief following the loss of 11 year old Willie Lincoln, third and much loved son of the President. The historical parts are accounts from staff, friends, witnesses, guests and colleagues as they write about Abraham Lincoln on the day of his son’s death, along with numerous general accounts from history. In letters, journals, memoirs- they recall the Presidential party that took place that evening, his behaviour, his appearance, they speculate with the benefit of hindsight about the suffering boy upstairs succumbing to Typhoid Fever. These sections are referenced within the body of the text, so the reader knows where they’re from. It’s a new kind of narrative woven together with scraps of other documents. It feels and reads like prose- it flows beautifully and does not feel for a second like the historical collage that it seems to be. It does mention in the Q&A with Saunders that some of them are fabricated. Personally I could not tell which, but was happy to go along with the author’s artistic licence and vision. It really is quite remarkable. The other side of the story is the bardo, a sort of Purgatory (according to Tibetan belief), a forgotten semi-existence between lives- after death but before the next life. This is where the confused Lincoln Jnr. wakes up, a graveyard city populated with nebulous, vague souls from across the ages. Our main narrators here are hans vollman, a newly re-married printer crushed by a beam in his office and roger bevins iii, a suicidal gay socialite, both of whom died at opposite ends of the 1840s. The third is the reverend everly thomas, a man escaping his final judgement. Vollman and bevins are something of a double act, commenting on goings on around the bardo and inviting various residents to have their say- they are both funny and tragic, utterly convinced that they are merely ill and due to return to ‘the previous place’ any day now. Abraham Lincoln, bereft at the loss of his golden child, visits him in the mausoleum. Unusually, he is visible to the bardo’s populace. Believing it to be some kind of omen or message, some potential way back in to the world, the bardo’s residents clamour to tell their stories to the boy and the grieving, unhearing form of his father. Though they do not know who he is, they sense that he is a powerful man. Some characters stick around for a while, some get the one chance to speak and are gone. Of the ones that stick around for a while, I found that their voices were so recognisable and distinct, that by the time the reader gets to the end of the segment, the notation of the speaker's identity is usually not needed, because you've grown to recognise how they talk, to whom they most regularly speak, and their backstory. I really enjoyed this and tore through the whole book in two days. Even the most confused reader cannot fail to be moved by the waves of grief emanating from the President as he spends one last night in the crypt, alone with his son’s body. It’s a partial biography of Lincoln, the private man, rather than the Gettysburg guy as well as a commentary of a time in American history, with plenty of throwbacks to the past. Interestingly (and importantly), slavers and slaves share the same bardo. All those important seeming in-life life distinctions of class, gender, colour, religion and age seem to carry no weight in the nothingness, as they are all there together. I felt the book’s lasting impression was about the idea of an eternal chance to learn to get along, something we are so bad at in life. Lincoln in the Bardo is a gorgeous book, an absolute one-off. It’s stunningly written, insanely evocative, funny, tragic, profound and ridiculous all at once. The delicacy of balancing farcical, comedic characters with such tragedy, such misery and grief is remarkable. It won’t be a book for everyone, the clamour of voices and the unorthodox style will put some off. But those that persevere are in for one of the most immersive, affecting reading experiences of their lives.